Suva is our nations capital and one of the most cosmopolitan cities in Oceania. Offering everything you’d expect to find in a large city – trendy shopping malls and farmers markets, restaurants, entertainment, and a huge range of cultural activities in a modern city built around older buildings which hint at our colonial past. Suva has a wide range of dining options from cheap eateries to high-end restaurants with a flavour of cuisine to tantalise everyones tastebuds. There are excellent bus services within and around the city, and a continuous bus service 7 days a week between Nadi and Suva that continues around the island via Lautoka, Ba and Rakiraki (although this service is less frequent on Sundays). 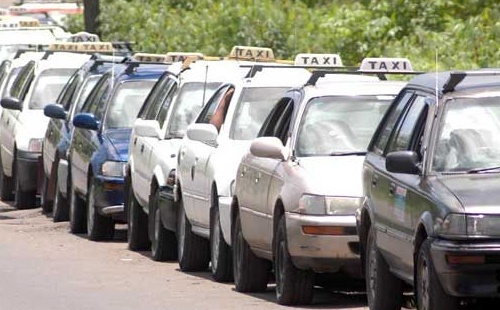 Taxis can be hailed simply by raising your eyebrows and are relatively cheap. 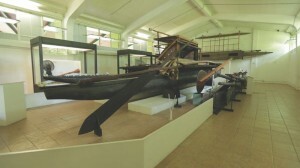 Located within the beautiful Thurston Gardens, the Fiji Museum is the oldest museum in the South Pacific. 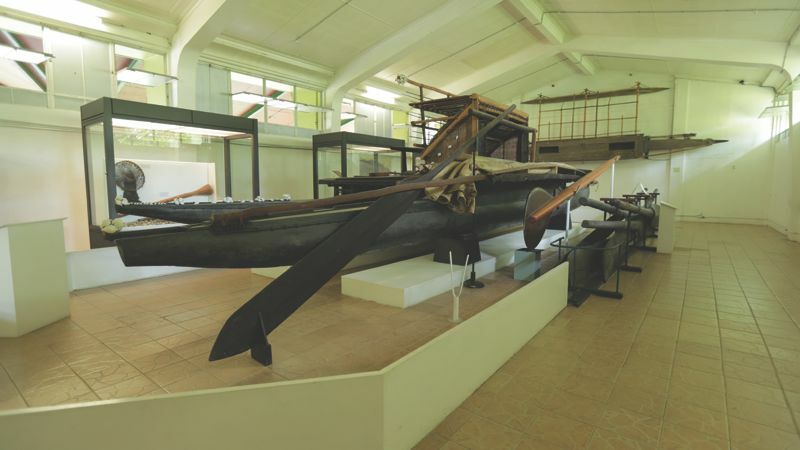 From photographs to a full size war canoe, the museum is brimming with archaeological findings dating back 3500 years, as well as cultural objects reflecting Fiji’s inhabitants during the past 100 years, this is an absolute must see attraction! 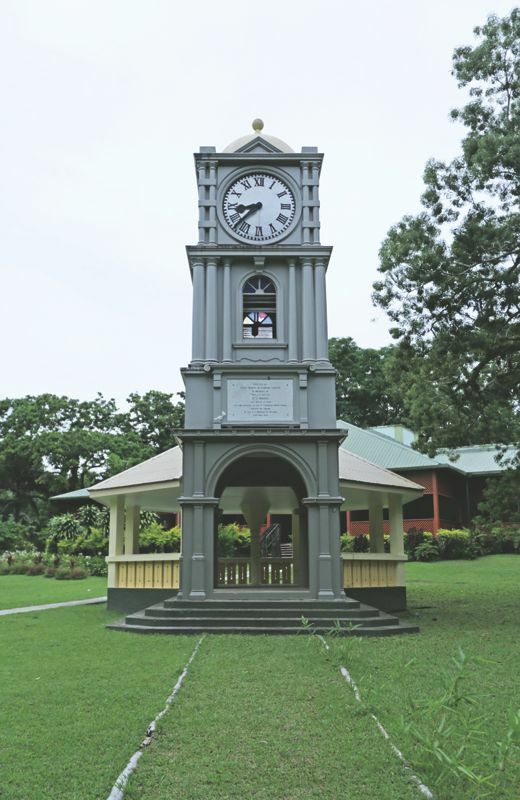 Located in Suva between Albert Park and the Government House, Thurston Gardens are built on the site of the original town of Suva the former inhabitants of which moved across the bay in about 1882. 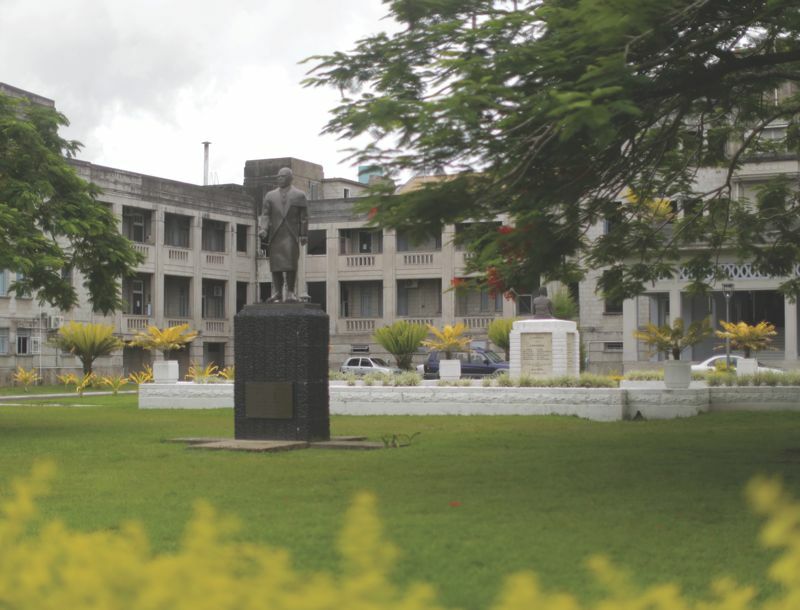 The gardens were renamed from the Suva Botanical Gardens to Thurston Gardens in honour of the fifth governor of Fiji, Sir John Bates Thurston who initiated the idea for a Botanical Garden in Suva. A stroll through the avenues of Royal Palms and tree ferns to admire the many varieties of palms, gingers, water lilies and other local flora is a wonderful way to spend an hour or two. Or perhaps a lunchtime picnic by the ornamental clock tower in an oasis of peace. Much of the vegetation is labeled, so even if you are not a botanist, you can still get a fair idea of what you are looking at! The Grand Pacific Hotel is located on the main sea front, on Victoria Parade. It was built by The Union Steamship Company in 1914 to serve the needs of passengers on its transpacific routes. The design of the hotel was to make the passengers think they had never gone ashore with rooms decked out like first-class staterooms, complete with saltwater bathrooms and plumbing fixtures identical to those on an ocean liner! All rooms were on the second floor, and guests could step outside to a wide veranda overlooking the harbor and walk completely around the building – as if walking on the deck of the ship. Today, a much needed facelift is being given to the old girl, and therefore a wander around this beautiful building is not possible. You can however walk past and give her a knowing nod as you imagine the wealthy passengers of ships similar to that of the Titanic, wandering around on the veranda, tricked into thinking they were still at sea! The official residence of the President of Fiji – Ratu Epeli Nailatikau. The present mansion was built in 1928 to replace the original building, which was the residence of the colonial governor that burnt to the ground after being struck by lightning in 1921. 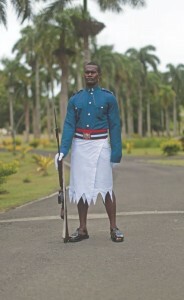 The building is closed to the public, but a highlight of a tourists visit to Suva is the changing of the guard ceremony during the first week of each month. Our version of Buckingham Palace! Charles Kingsford Smith was the first aviator to cross the Pacific, flying in his little Fokker F.VII/3m monoplane ‘The Southern Cross’ from California to his homeland of Australia. The longest leg of his of 12 Pacific Island flight was the 34-hour trip from Hawaii to Fiji. The campus is on the site of a New landing strip for his arrival. Kingsford Smith and his seaplane base and inside the northwestern crew arrived on 6 June 1928, and were welcomed entrance, on the right, is a small botanical garden by a crowd of thousands. Sydney’s ‘Kingsford Smith with peaceful trails winding around Pacific trees and International Airport’ – is named in his honour. plants. 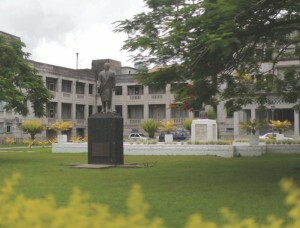 Home to students from all over the world, the main campus of the regional university is based in Suva. With beautiful lawns and excellent facilities, the USP’s Laucala Campus offers some picturesque strolling and fascinating people watching. USP is the only university in the Oceania region to be internationally recognized outside of Australia and New Zealand and is ownedby the governments of 12 Pacific Island countries: the Cook Islands, Fiji, Kiribati, Marshall Islands, Nauru, Niue,Zealand and Vanuatu. 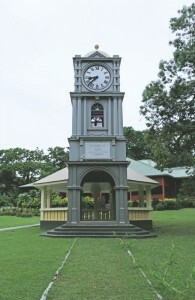 You can also visit the Oceania Centre for Arts Albert Park was also the site of the first hoisting of & Culture where you can see temporary exhibits the new national flag of Fiji on 9 October 1970 when of paintings and carvings and sometimes even Fiji attained her independence from the United watch an artist at work. The Oceania Dance Theatre and other performance groups use the centre and you can usually catch a free rehearsal on weekday MORNINGS! The Hindu religious fire-walking festival is held here during July or August and lasts for 10 days. Performed mostly by descendants of southern Indians who believe life is like walking on fire; discipline helps them to achieve a balanced life, self-acceptance and to see good in everything. On the final day of the festival, the participants at the Mariamma Temple bathe in the sea. If you like hiking trails, swimming, and birdwatching, this is the place for you. Spend a day walking around the sub tropical rainforest of Colo-i-Suva, there are a number of clearly marked tracks to chose from that lead to a series of beautiful waterfalls that you can swim in. Across the road from the main entrance, you will find the ‘Raintree Lodge Eco-Tourist Resort’ where you can sit and relax after your adventures with a coffee, juice, or if you are hungry, something from their delicious menu! A nominal entry fee of FJ$5 is payable to the park ranger located opposite the park entrance. Although situated under a car park, and so not exactly inviting to the eye, this market will be attractive to your purse! Brimming with authentic local treasures, shipped in to be sold from the outer islands where traditional crafts are an essential part of the culture. Traditional crafts still practiced today produce such items as hand carved wooden kava bowls (tanoa), or traditional war club replicas, hand painted masi, woven baskets; the list is endless and old is of course mixed with new. 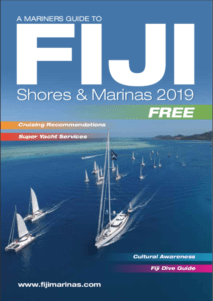 You will have heaps of fun bargaining with the vendors, while helping Fiji’s economy by supporting our local artisans. The way to a sailors heart is through their stomach….right? After a long voyage, your fresh fruit and veggie supplies will likely be low, so why not take a trip to the amazing Suva Market. At incredibly low prices, it is easy to ensure you have enough to get your ‘5 A DAY’. A sensory overload of colour awakens the eyes, the sound of several languages being spoken at once, the smell of fresh herbs and spices, the taste of ready prepared snack size pineapple and watermelon, and the feel of the plump succulent fruit as you load it onto the scale. Friendly ‘barra boys’ are on standby to help carry your heavy items in their wheelbarrows. These young entrepreneurs make a living from ‘tips’ received for helping shoppers by transporting goods to awaiting transport. The Suva Market is probably the largest retail produce market in the South Pacific islands. Locally grown and imported fruit and vegetables, free range eggs, tofu, kimchi, and fresh seafood straight from the ocean seafood are all laid out in an array of colour. Don’t miss the upper floor where your can stock up on your kava offerings if you plan on exploring our outer islands. Note: A good time to visit the market is on Friday and Saturday mornings, however, some people swear by trips to the market late afternoon for real bargains because that’s when vendors simply want to clear their shelves and close up for the day. Located at the purpose built Damodar City shopping complex, Premium and Vmax showings are a popular way to spend an evening catching up on the latest movie releases. 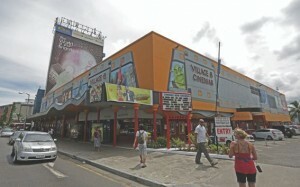 A six screen, fully air-conditioned cinema showing latest and 3D releases. Buy a box of freshly popped popcorn or another sweet delight, settle into a wide, comfortable chair, and enjoy! For movie listings and admission prices, click here. Nestled in the heart of a dusty industrial estate a short taxi ride out of central Suva. As soon as you walk through the main doors, all the cares of the busy outside world magically disappear with each step as you begin your journey through the oasis. They offer a wide selection of treatments and afterwards, you are able to purchase any of their delicious smelling, totally natural lotions, oils, candles, soaps etc from the factory shop. If you are looking for an escape from reality, and love being pampered, drop in to the Jade Spirit Spa. Using jade-healing stones to help relax and calm, there is a sauna to help improve blood flow and further relax the body. Chinese pressure point massages and Thai massages are also available if you really want to loosen up after a long passage. Open since 1995 and housed in two side by side wooden colonial cottages, Head to Toe is known for its service and quality and guys – if you are interested, there is a specially tailored ‘Male Time Out’ package just for you! A modern salon where you can get a great new hair style at the same time as a manicure! Offering the high standards that you might expect in cosmopolitan cities with a touch of the pacific.